Charlotte of Wales and Leopold of Saxe-Coburg-Saalfeld are one of my favourite historical couples and thus I was very glad to see a book dedicated to their love story. The book is primarily the biography of this unfortunate princess who has now became a footnote in history books but whose premature death has changed the course of British history. But her relationship with Leopold takes up, obviously, most of it. Charlotte was the daughter of the dissolute Prince Regent, who eventually became George IV, and his coarse wife Caroline of Brunswick. Their marriage was a disaster from the start. They separated almost immediately and did everything they could to make each other and, as a result their daughter, miserable. Despite this, Charlotte turned out well, and was very much loved by the people who hoped she would restore the image of the monarchy and the royal family. Sadly, their hopes were too soon destroyed. Everyone rejoiced when Charlotte married her Prince. The couple cared deeply for each other and did everything together. But after a year and a half of marriage, Charlotte died after giving birth to a stillborn son. Leopold was distraught and even though he would go on to become King of the Belgians, and remarry, he never forgot his first wife. Had she lived, his niece Queen Victoria, would probably never have been born. Although George IV had several siblings, none of them had legitimate children, and, until this tragedy occurred, hadn't really shown any inclination to get married. Chambers' biography reads more like a novel than a biography. It flows easily, is entertaining and is light without being shallow. However, it isn't in-depth. While we get to know Charlotte quite well, especially thanks to her correspondence which is amply cited in the book, we're not told much about Leopold. His life after Charlotte's death is summed up in just a few short pages, which is something that really disappointed me as I have a bit of a crush on Leopold and would have loved to know more about him. Information on Regency England and the political and historical situation of the country at the time is also lacking, so if you're not familiar with this period you won't learn much from this book. It is true that too much information about genealogy, politics and economy can bog down a book and make it boring, but too little information is just equally bad. However, because of this, the book will appeal even to those people who aren't particularly interested in history but love a good, albeit tragic, love story. 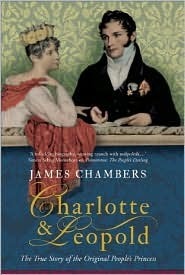 Charlotte & Leopold by James Chambers is a wonderful introduction to Charlotte's life and her marriage with Leopold, but if you're looking for an in-depth study about this often forgotten historical figure and the period she lived in, this book is not for you. The writing style is very entertaining, making the book read more like a novel than a biography.